Choose from thousands of spaces near Millennium Stadium - including on-street parking, off-street car parks and 485 reservable spaces. Millennium stadium is located in the heart of Cardiff city centre, best accessed via the M4 from England and then by following the A48 into the city. There is no parking made available at Millennium stadium itself, but due to the stadium’s close proximity to Cardiff city centre there are a good choice of off-street car parks and on-street spaces nearby. Cardiff’s 3 park and ride sites can also provide an alternative low-cost option for visiting the stadium. 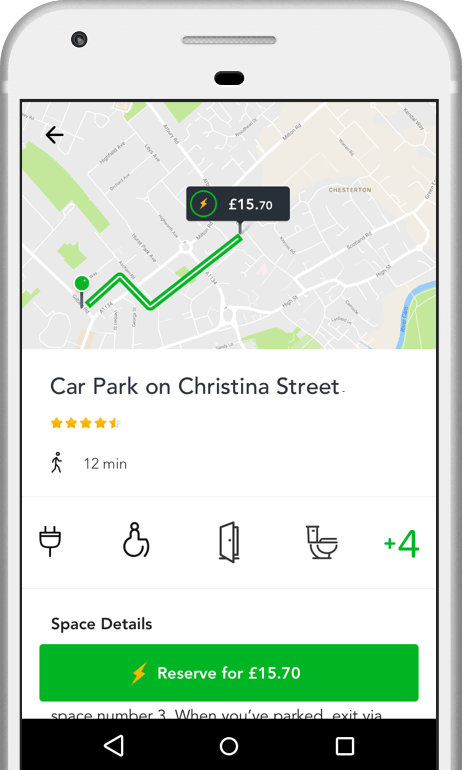 JustPark provides information on a large number of parking options nearby, many of which are reservable – including spaces on-street and off-street, from driveways to car parks. On-street parking is particularly difficult around the stadium due to its somewhat awkward location on the river by the city centre. On-street parking on any day is quite challenging, but on event days heavy congestion and limited spaces mean that parking is particularly tricky for visiting drivers. Millennium stadium is located in Cardiff’s Central Parking Zone which also incorporates most of the city centre. Nearby on-street parking is limited to pay-and-display spaces, and these can be hard to come by. Parking charges typically apply from 8am-6pm, Monday-Saturday. You can use our parking map to find information on available on-street parking spaces near Millennium Stadium. There is no parking made available at the stadium itself due to its location sandwiched between the city centre and the River Taff. However, there are a good number of affordable and well-located off-street car parks throughout the city centre. A convenient option very nearby though is Cardiff Central Station car park (Cardiff Central Station, Cardiff, CF10 1EN), centrally located on-site at Cardiff’s principal railway station just a short walk from the stadium and city centre. This car park offers competitive daily and overnight rates and is open 24 hours a day, Monday-Sunday. However, on event days, parking spaces here will be understandably limited. Alternatively, Cardiff Council provide 3 park and ride sites that serve the city with bus routes to and from the centre, not far the stadium. Cardiff East (CF23 8HH) runs Monday-Sunday, Cardiff West (CF11 8EG) runs Monday-Friday, whereas Cardiff South (CF10 4UW) only runs on Saturdays. Cardiff Central railway station is located just across the road from the stadium, handily providing fantastic access to the stadium for any occasion. This is a major train station with regular services to and from many cities across the UK, as well as areas more locally within Wales. Blue Badge holders may park for free and for an unlimited amount of time in any of the city’s on-street pay-and-display spaces, designated disabled bays, and in many of Cardiff Council’s off-street car parks. Blue Badge holders may also park for up to 3 hours in resident permit bays during controlled hours – as well as on single or double yellow lines, unless loading bans are signalled locally. You can filter when searching on JustPark to show all our parking spaces with disabled access around Millennium stadium (select this option by clicking ‘Filters’ on the search results page). Parking is difficult at the best of times around Millennium stadium, but on event days visiting drivers are advised to use the city centre off-street car parks – or consider travel some of their way via public transport. Parking isn’t so much restricted, more that it is generally quite difficult regardless, due to the stadium’s location in amongst the busy city centre. Always make sure to read local signage to ensure you are not parked illegally. The Millennium stadium was built just before the turn of the millennium in order to serve as Wales’ national stadium. It plays host to major sporting and music events throughout the year, and is a lovely-looking spectacle sat on the banks of the River Taff. From the stadium, you are within walking distance of everything within the city centre – like the historic Cardiff Castle or the awesome Cardiff Central Market, where you can buy an eclectic mix of things. Park up, enjoy the stadium and belt out bydded i’r hen iaith barhau. Rated 5 stars with an average satisfaction rating of 96%, JustPark is the UK’s favourite parking service. But don’t just take our word for it – check out some of the latest customer reviews for our Millennium Stadium parking spaces at the bottom of this page.